We joined this Trade Mission to China as we believe that we can help chinese companies to bring their products to the European market. As we are a one-stop-shop in the field of logistics we can handle the whole supply chain; Sea-,air- or railfreight, customs clearance, warehousing, assembly, labeling, packaging, but in the end the orderpicking and distribution of the products. And we can do that to B2C and B2B markets to all countries in Europe. With our location close to Rotterdam, we can act as the Gateway to Europe. Kolibri Logistiek joined of course the Logistic & e-commerce sector that went to two cities in China; Shanghai and Guangzhou. Because these cities have big harbours they would have the biggest potential for Logistics & e-commerce. 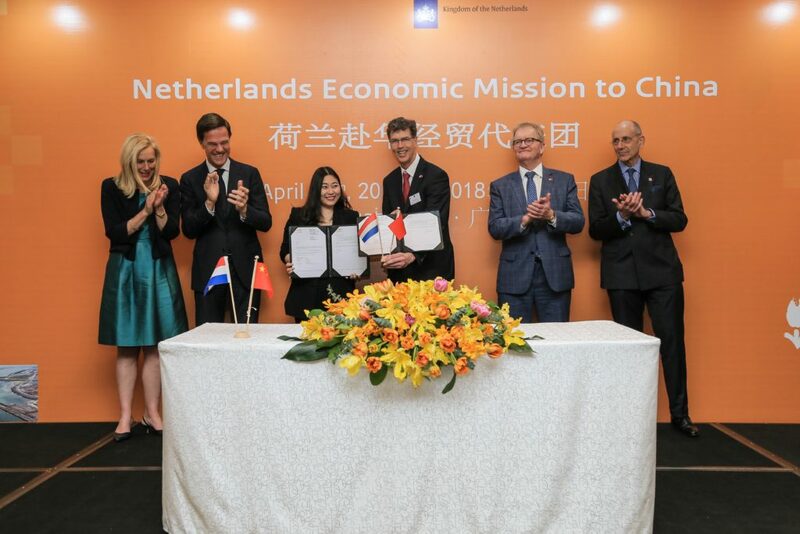 The other sectors went to other cities but we would all come together in Guangzhou where there would be a possibility to sign business contracts with presence of Prime Minister Mark Rutte and Sigrid Kaag the minister for Foreign Trade and Development Cooperation. Arriving in China on Shanghai Pudong Airport we took the Maglev train to downtown Shanghai which reached a speed of 430 km(!) per hour. In Shanghai we were welcomed by the Consulate, Hans de Boer from VNO-NCW and Minister Sigrid Kaag. From the roof garden of the Peace Hotel they showed us the beautifull sight on the Bund of Shanghai. The next day we visited the company Kuyken Logistics and afterwards the port of Shanghai. On the Trade Mission reception we had a meeting with our client Kodama who are designing and engineering 3D printers. After two days Shanghai we took an inland flight to Guangzhou, where the other sectors would all come together. Together with the Agrifood sector we had a perfectly organised matchmaking session in the Four Seasons Hotel in Guangzhou. All the attendents got an interpreter that had really prepared themselves and checked out the websites of our companies. After the matchmaking session we went back to the Carlton-Ritz Hotel and prepared ourselves for a group picture and after that the signing ceremony. 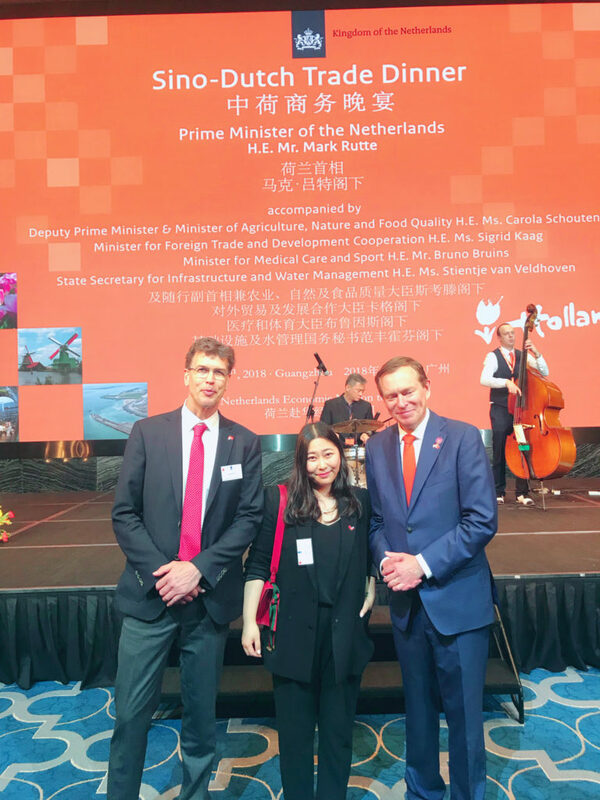 We had invited our client Podiumax to sign a contract under supervision of our Prime Minister Mark Rutte and our minister for Foreign Trade and Development Cooperation Sigrid Kaag. From left to right: Minister for Foreign Trade and Development Cooperation Sigrid Kaag. Prime Minister Mark Rutte, Director of Podiumax Cai Li. Director of Kolibri Logistics Rene Gouw. President of VNO-NCW Hans de Boer. Ambassador of the Netherlands Ed Kronenburg. After the signing ceremony we were all invited for a great dinner. Ofcourse our Prime Minister gave a speech to stress the importance of these trade missions to get new contacts and the importancy of the Netherlands who can play a big role in developing the one road- one belt policy. And with our mainport Rotterdam we are really the Gateway to Europe. Minister of Health and Sport, Bruno Bruins found time to discuss the importancy of sports for children with Cai Li. The last day Kolibri Logistiek was invited to visit the office of Podiumax in the Yuexiu district in Guangzhou to meet their team. It was great to learn about their new concept Hup! Hup! a brand to learn chinese children (and their parents) that sporting, and especially football will contribute to their development in life. After returning to the group in the Pullmann Hotel on Guangzhou airport we held an evaluation of the Trade Mission for the Logistic sector. We all agreed that it was an interesting trip with a lot of seminars and visits but that there could have been more matchmaking sessions in order to make more new contacts, after all that was the main reason we went to China!